Property 6: Welcome to the Smokies! Property 10: Ready for Some Quiet Time While on Vacation? Try Us!!! Property 12: Great Location- On the River- Easy walk into town! WARM FAMILY HOME in Downtown Gatlinburg ~ "PARK & WALK"
Property 17: WARM FAMILY HOME in Downtown Gatlinburg ~ "PARK & WALK"
Property 19: Unique 3BR Gatlinburg Cabin w/Foliage View Decks! Relax at the Firefly Retreat! Within walking distance of downtown Gatlinburg! Property 20: Relax at the Firefly Retreat! Within walking distance of downtown Gatlinburg! Secluded Cabin in Gatlinburg! Ask owner about $35 off nightly in FEBRUARY ONLY! Property 22: Secluded Cabin in Gatlinburg! Ask owner about $35 off nightly in FEBRUARY ONLY! Stay with us at Birdseye View! Property 26: Stay with us at Birdseye View! Relaxing stay on top of beautiful English Mountain. Property 29: Relaxing stay on top of beautiful English Mountain. AUTHENTIC GATLINBURG, TN LOG CABIN "GOOD TIME LODGE"
Property 30: AUTHENTIC GATLINBURG, TN LOG CABIN "GOOD TIME LODGE"
$100* per nite One of the best deals in the Smokies! Approx 8 miles to Parkway! Property 31: $100* per nite One of the best deals in the Smokies! Approx 8 miles to Parkway! Beautiful Home Next To National Park! Read our reviews! 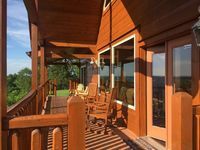 Property 34: Beautiful Home Next To National Park! Read our reviews! RIVER FRONT in Sevierville! Near Golf Course & Convention Center! Property 35: RIVER FRONT in Sevierville! Near Golf Course & Convention Center! EASTER BOOKING AVAILABLE. MOTHER'S DAY COMING SOON. BOOK NOW !! Property 39: EASTER BOOKING AVAILABLE. MOTHER'S DAY COMING SOON. BOOK NOW !! Property 47: Creek HavenSecluded, quiet, full creek, 20 mins from pigeon forge, gatlingburg! 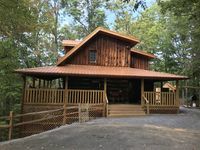 Property 49: Cozy Cabin w/Hot Tub Mins to Pigeon Forge Parkway! We have stayed in a lot of places but this by far is one of the best places yet! They had everything you needed to enjoy your stay! If you love the outdoors you will love Good Times. The owners attention to detail is over the top. We will definitely be back. The house was located high on a hill overlooking green hills, farms,, and beautiful sunsets. The home had two comfortable beds and three futons., plenty of room! I loved having the kids in the loft, so we could hear them easily. The kitchen had tons of dishes and cooking supplies. I enjoyed it being away from the hustle and bustle, very peaceful. One suggestion might be better quality towels, and more of them, but really, that's minor.